When it comes to quality home renovation projects, many homeowners in Georgia are faced with a myriad of design choices, each with its own unique influence on the finished product. Your kitchen cabinets, for example, play a major role in the mood of your space, especially when they make a statement in conjunction with your hardwood floors. How you choose to match your floors to your cabinets is completely your choice, but remember that your choice may play a major role in the visual aesthetics and overall value of your kitchen renovations. Kitchen remodeling is the perfect time to consider giving your cabinets a facelift. As a professional provider of cabinet refacing to Atlanta homes, Detail Design & Remodeling is here to offer cost-effective solutions that can transform the look and feel of your kitchen without breaking the bank. Our home remodeling contractors excel in a wide range of services ranging from minor improvements to custom cabinet fabrication. We infuse old-world craftsmanship into your modern home for an amazing result each and every time! Our cabinet refinishing experts are here to transform your kitchen to the best of our abilities. Today, we’ll discuss a few facts and tips related to matching your floors and cabinets for the best outcome. If you are considering affordable and durable solutions for your home improvement project, be sure to contact us to learn more about our kitchen cabinet refacing services! To Mix or to Match? The look of hardwood floors is hard to beat, featuring beautiful grain patterns and an aesthetically pleasing warmth that helps to transform a house into a home. Many people look to initially match each aspect of the home; matching is an easy way to avoid conflicting colors or patterns. While this can appear to be an attractive design option to many homeowners, we recommend against trying to match your flooring with your new cabinet refacing surfaces. One major challenge in finding a matching product is the limited chance that you can find an ideal match, with different grain patterns, finishes, and stains creating a wide range of styles. In many cases, materials that nearly match but don’t sync up are far less visually enjoyable than contrasting elements! The design world is full of possibilities, meaning that the quality of a project’s outcome is entirely in the eyes of the beholder. If you need help narrowing down your color choices, be sure to ask our custom cabinet contractors for assistance! While every kitchen is different, the best approach is often to decide on two dominant colors that will command the attention within your space. These two frontrunners should be complementary in nature, delivering more versatility for your kitchen as you decide to make improvements in the future. A third color option should be used to work as the accent for your space, creating a catchy visual that ties the entire room together while imbuing the kitchen with your personality. DIYers looking to create amazing outcomes for their space can go to local home improvement stores, reach out to professional designers, or contact our custom cabinet makers for design assistance! If your floor is here to stay, it can be easier to base the color of your counters and cabinets in relation to the floor’s pattern and color. Utilizing secondary color schemes for your cabinets and counters will be helpful for distinguishing your floor from any vertical elements, creating clear boundaries that produce precise, modern visuals. One bold approach to creating drama and depth in your space is to contrast your cabinets and countertops with your flooring. 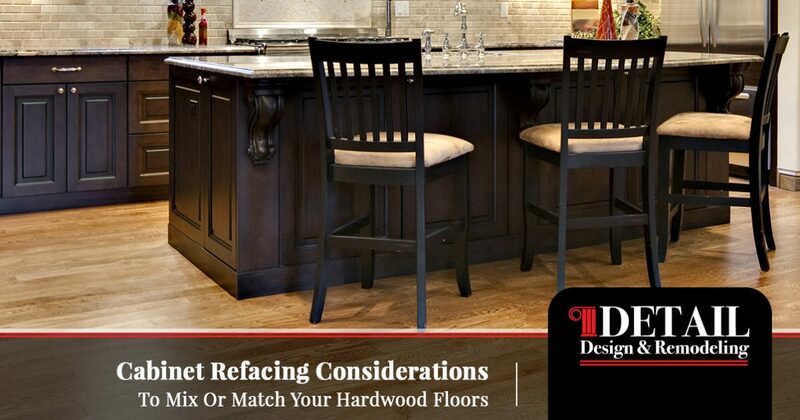 Combining dark wood flooring with white cabinet refacing, for example, can create a stunning balance. Home remodeling contractors across the country have experimented in creating dynamic color schemes in relation to the kitchen cabinets and flooring. In every case, the proper use of balance in conjunction with quality color schemes can create unique outcomes that serve to differentiate your Georgia home from the others in your neighborhood. On the subject of contrast is one interesting approach that consists of matching your hardwood flooring to the lower cabinets in your kitchen. In many cases, this approach consists of pairing cabinets and floors that are similar in shade and tone. Homeowners have found success contrasting dark floors and lower cabinets against brighter upper cabinets. Cabinet resurfacing and refacing can allow you the unique opportunity to mix different cabinet patterns in the same kitchen. Homeowners who like contrasting elements for each aspect of their space often enjoy the outcome when they create different visuals for different parts of the kitchen, such as your island cabinets differing from the cabinetry along the perimeter. Installing brighter elements overhead can create a stunning contrast against your Brazilian walnut floors! While matching your floors to your kitchen cabinets is not recommended, it’s important to remember that you have a wide range of design choices at your disposal. One eco-friendly and cost-effective approach for changing the color of your cabinets is to invest in professional cabinet refinishing. Detail Design & Remodeling specializes in delivering high-quality cabinet refacing to Atlanta homes, creating a durable facelift for your outdated cabinets that will transform them into modern masterpieces. 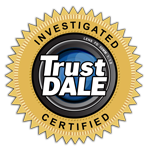 Our professional process ensures the highest level of quality, delivering quicker results that get your daily routine back on track faster while leaving more money in your wallet. If you need assistance planning your kitchen renovations, be sure to reach out to our home remodeling contractors first. Contact us today for assistance!